Rustic meets modern with the charming DIY guide, Wood Pallet Wonders. This instructional collection of twenty incredible home design projects uses wood pallets and reclaimed materials to create eye-catching storage and décor. From the rustic Chevron Coffee Table and the beautiful Herb Garden to the stylish Bar Cart, beginner and veteran DIYers alike can take delight in crafting rustic projects that will impress and inspire without breaking the bank. With easy-to-follow, step-by-step instructions on crafting simple and stylish projects, you can add exquisite designs to your home or find inspiration for your own unique touch! For the past few years, I have been doing a lot of DIY projects. We have done several big projects, mostly to do with remodeling the house. I find myself wanting to do more DIY projects to add extra touches of charm to my house inside and out. One DIY area that I find interesting and want to learn more about is projects with pallets. You know, the big wooden things that you ship stacks of goods on (there are a lot of different kind of “pallets”) I have seen many different projects on Pinterest. Often, I will see pictures, but no step-by-step instructions or lists of needed materials. With none of this information, I just move on to a different project. When I received the “Wood Pallet Wonders” book I was thrilled. Finally, a DIY book with 20 stunning ideas accompanied by easy-to-follow, step-by-step instructions and a materials list. I’m not much of a hands-on-tool type person but as long as I have instructions to follow I can do just about anything. This book offers project ideas such as tables, shelf's, storage items, décor, and so much more. As previously mentioned each project is made easy with a list of tools and materials you will need specific to that project. The detailed step-by-step instructions also include pictures. There are also suggestions for optional finishing touches you can add to make the piece unique. I will take any guidance I can get when doing a DIY project. 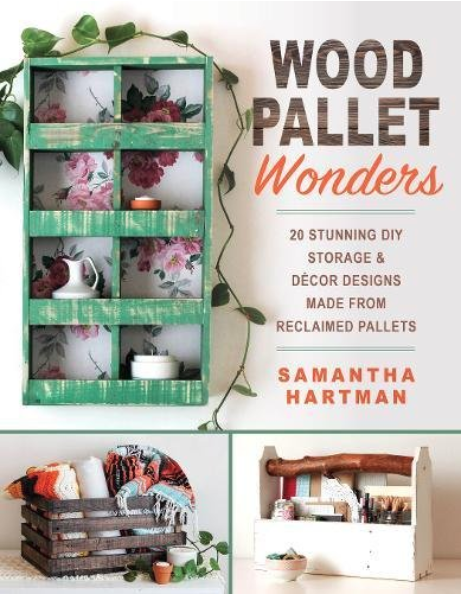 With the warm weather right around the corner, I can already see all the many pallet wonders I will be creating with the help of this amazing book. It is a welcome addition to my collection of other useful books and will be a very nice resource as we head into (hopefully) nicer weather! I like the wood pallet idea. Very creative.